If it's alternative, handmade, vintage, cool, retro, antique, classic, funky, ethnic (we could go on) chances are, you can find it in Camden Market. 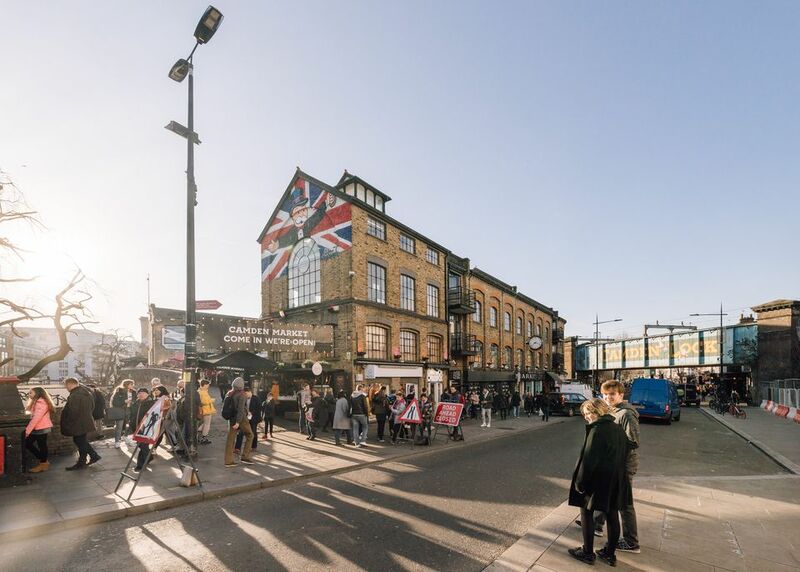 More than 100,000 visitors head to Camden Town every weekend for total immersion retail on the wild side. It's the most concentrated place in London to search for original and unusual merchandise from hundreds of independent stall holders, designer-makers and shops. Camden High Street is lined with shoe stores, leather shops and vintage clothing and vintage vinyl. Lots of people - both visitors and Londoners - think it's a cool place to hang out making it busy all the time and heaving all weekend. Most of the main shops are open every day so there's always plenty to see and buy. But if you really want to see the stalls sellers in action, Sunday is the busiest and best day. And if you have the stamina after a day of battling for bargains, there's a is a good nightlife scene with legendary clubs,bars and music venues all over the area. The development of this area into a lively community and and shopping destination had several false starts before the markets of today were born in the 1970s. The first attempt at development was by Charles Pratt, 1st Earl Camden, near the end of his long career. Active in Parliament and the Lords, he served as Lord Chancellor in the late 18th century. His Parliamentary speeches against taxing the American colonies and for recognizing their inevitable independence (some written with the help of Benjamin Franklin) earned him a legacy of respect in the early United States with towns named after him in Maine, North and South Carolina and New Jersey. In 1788 he was granted permission to layout a development of 1,400 houses on land he owned in North London. He divided the land and leased it out for development but very little happened for another 100 years. Still, the name Camden Town was born. The second false start happened after the Regent's Canal was built through Camden's estate. The Canal was completed around 1820 and the area began to be populated with modest workshops and light industry. Once the railways were built, the canals lost business as trade conduits. Regent's Canal was sold to a railway company and plans to convert the route for a railroad were drawn up. Warehouses and workshops clustered around the canal locks in anticipation of a new and important trade route through London. But this boom didn't last long. By the 1870s plans to build this railroad had been abandoned. It was never built. Throughout most of the early 20th century, the warehouses lay empty, the area rotting and derelict. Another hundred years passed before several entrepreneurs saw potential in the derelict buildings. In 1972, a pair of childhood friends bought a shabby timber yard from T.E. Dingwalls and created the Camden Lock Market, one of London't first artisan crafts and antiques markets and the magnet that drew other retailers and stall owners to the area. A year later, in 1973, another pair of entrepreneurs turned an old warehouse into Dingwalls Dance Hall - a place that virtually gave birth to Punk Rock. From its start as 16 market traders, Camden Market has grown to more than 1,000 market stalls and shops in four main markets, and small clusters of stalls in offshoot branches in courtyards and side streets. The markets are located along Camden High Street and Chalk Farm Road (the same street, it just changes its name after the railway bridge) between Camden Town and Chalk Farm Tube Stations on the Northern Line. Camden High Street is lined with shops, pubs, markets, and restaurants. After the railway bridge, you'll find more of the same along Chalk Farm Road. The market is divided into smaller markets and technically each is supposed to have its own special style. Camden Lock Market This is where the markets began in the 1970s, in stalls clustered around the canal and locks - not "Camden locks" by the way, there aren't any. The locks that give the market its name are the twin Hampstead Road locks on the Regent's Canal. Once mainly a craft market, it now features loads of market stalls and shops selling clothes, jewelry, and unusual gifts. There are indoor and outdoor areas and great food stalls next to the canal. The market is open every day, between 10 a.m. to "late". Camden Stables Market has over 450 shops and stalls including a good range of vintage clothes shops. Expect to find plenty of clothing and accessories. There are also loads of food stalls offering cooked food to takeaway from around the world. The market gets its name from the network of stable blocks, horse tunnels and tack rooms, along with a horse hospital, that once served the population of good hauling horses that shunted cargo and rail cars along the canal. The last shunting horse was retired in 1967, but the stables remained in operation as late as 1980. Some of the retail spaces are unique. Look for vintage in the Horse Tunnels Market, a series of Victorian brick tunnels that is part of this market. This market has a bronze statue of Amy Winehouse who first achieved fame playing in clubs in the area. Camden Lock Village This area, reached just after crossing north on the canal bridge, on the right, was known as the Canal Market until virtually destroyed in a devastating fire in 2008. As part of a major residential and retail redevelopment project, this market was given an improved layout and a new name. Reopened as Camden Lock Village, it specializes in accessories, fashion and gifts. Buck Street Market This is the first market you come to when you head north from Camden Town Tube station. It's not really part of Camden Market and it's one you can probably give a miss. This used to be a place to buy vintage 1950s and 1960s clothing. Now it's where you can find cheap sunglasses and slogan printed t-shirts. Plans are in the wind to relocate some of the traders to the main markets while a new Container Park, similar to Pop Brixton and Boxpark Shoreditch is created - we'll keep you posted if that happens. It's a lot of fun to poke around these markets, to people watch and to enjoy the vibe. This is London street style at its purest. But don't expect to discover the latest unsung fashion designer hiding in one of the stalls or shops. You might, but then again, you probably won't. There's a kind of market style that hasn't changed much in 50 years - silver skull jewelry, tie-dye (yes really, still), leather goods, bovver boots, scented candles and the smell of incense - and most of what you'll find here lives in that timeless bubble. Keep your wallet out of sight and keep handbags close to your body. Beware of pickpockets. Do not give money to beggars. Beggars hang around Camden Town tube station. Do not give them money however sad their story may be. They are there every day. In Britain, you're not legally obliged to carry any identification so leave your passport in the hotel safe whenever it's not needed. Visit the ZSL London Zoo in Regents Park. It's a 15 minute canal side walk. Take a quiet walk or go celebrity spotting in Primrose Hill. The hill, in the northern section of Regents Park, is one of the highest viewpoints in London with virtually 360 degree views of the city. It's a lovely quiet, grassy and tree dotted slope, flanked by the homes of the rich and famous. The residential area is also called Primrose Hill. If you haven't tired of shopping, this area is dotted with posh boutiques. It's especially good for designer children's clothing supplied to the yummy mummies who live around here. Board a canal boat for a cruise along the 200-year-old Regents Canal. The London Waterbus Company has hourly departures from Camden Locks to Little Venice, traveling through Maida Vale Tunnel and Regents Park and London Zoo. You can disembark at the zoo with the price of admission included in your boat ticket. Check the timetable on their website, then turn up 10 minutes ahead of time and buy your ticket, with credit or debit card no cash is taken. And don't bring your bicycle, scooter, skateboard or pet. Go to a gig. Top off the evening at the Jazz Café one of London's most famous live music venues. If you book for the music, you can also have dinner in the balcony upstairs - a more relaxing place to enjoy the music, perhaps, than the mosh pit below. Also check out Underworld for live rock gigs and Dingwalls, the grandaddy of them all with live music and comedy since 1973. Lots of the pubs in the area have live music and you can never tell what local or touring musicians might turn up. You can usually pick up leaflets near Camden Town station to see what's going on, or check Time Out's hot list gig pages.